Unlike some of the round flat peyote instructions I’ve seen on the internet this method creates a piece that is really, really round! The other methods I’ve tried will create a hexagonal piece if you try to make a large piece. By using a series of carefully spaced increases this method works and can be used for many things. The instruction will show how to make .5, 1, 1.5, 2, 2.5 inch round pieces. These instructions will show you how to do this method with bead by bead graphs. 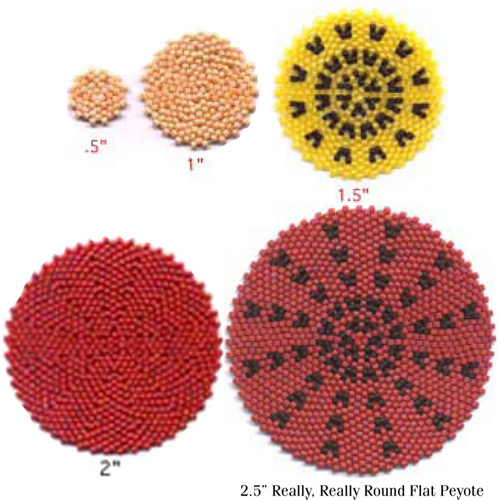 It's easy and fun to make Really, Really Round Flat Peyote pieces! You can use these round pieces for many things. The 1/2" round makes a great bottom for a needlecase or bottle. I will have patterns soon that use this method as a base. In the meantime let our imaginatin go wild with these!